Meet the new members of the Orchestra Academy! The Canadian Opera Company Orchestra Academy welcomes five student musicians to its annual three-week intensive training program. Led by COC Music Director Johannes Debus, and developed in collaboration with The Glenn Gould School at the Royal Conservatory of Music and the University of Toronto’s Faculty of Music, the COC Orchestra Academy offers its student musicians professional insight and experience in their pursuit of a career in an opera orchestra. The five student players who join the Academy this year were selected from a pool of 12 musicians who auditioned in October 2015 for Debus, COC Orchestra Academy Director Nina Draganic and members of the COC Orchestra: GGS cellist Drew Comstock, GGS violinist Hua-Chu Huang, GGS violinist Yada Lee, GGS bassist Doug Ohashi and UofT violist Meagan Turner. 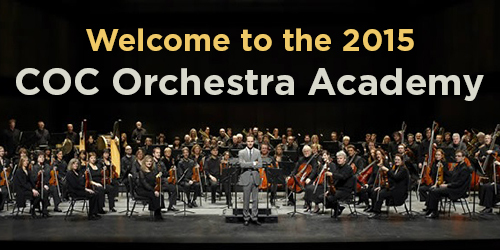 Welcoming in the Newest Members of the COC Orchestra Academy! The Canadian Opera Company Orchestra Academy returns for a second year on January 12, 2015, this time welcoming five student musicians into the acclaimed COC Orchestra for an intense three-week period that offers them professional insight and experience in their pursuit of a career in an opera orchestra. Led by COC Music Director Johannes Debus, the COC Orchestra Academy has been developed in collaboration with The Glenn Gould School at the Royal Conservatory of Music and the University of Toronto’s Faculty of Music. The five student players who join the Academy this year were selected from a pool of 14 musicians, from GGS and UofT, who auditioned for Debus and members of the COC Orchestra in November 2014: GGS double bassist Malcolm Armstrong, GGS cellist Tess Crowther, UofT violinist Eric Fujita, GGS violinist Brenna Hardy-Kavanagh and GGS violist Laurence Schaufele.